Shop for Debian Linux software. Debian is a Linux distribution developed using an open community project. The project was originally started by Ian Murdock in 1993, and was for a time led by Bruce Perens. Debian has been highly influential and serves as the basis for several other distributions including Knoppix, Linspire, Ubuntu and Xandros. Debian, the grand-daddy (and great-grand-daddy) of dozens of Linux distributions, is perhaps the standard by which almost all other Linux distros are measured. Stable, fast, and slick, it is one of the best choices for anyone who wants to run Linux. 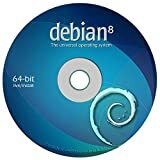 This DVD is the live Gnome version of the newest and best release of Debian - 8.2 - packed with the latest and greatest technologies and features available to any Linux distribution. Debian is a Unix-like computer operating system and a Linux distribution that is composed entirely of free and open-source software, most of which is under the GNU General Public License, and packaged by a group of individuals known as the Debian Project. The Linux Diversity Collection was assembled for Linux enthusiasts and includes the newest and freshest releases of Ubuntu, Kubuntu, openSUSE, Fedora, and Debian. PRIZIX has some simple, complete and inexpensive solutions for you. Our Linux sets offer you the very best in effortless installation, so you'll be up and running in no time! If this is your first time with Linux, you will appreciate the beautiful, clear graphics that make custom installation so easy. All our sets contain only the newest, most complete DVD releases. You'll find office applications, web browsers, email programs, instant messengers, graphics packages, audio and communication tools, you name it! No hassles, no license fees, no prohibitively expensive software! All our packages come with the video-DVD "Brief Introduction to Linux." So if you are new to Linux's command-line workflow and are in the mood for learning basic concepts and commands, you've got it! You will be amazed at how much you will learn from this brief presentation. All our sets include the "UNIX Academy Selected Training Library" in PDF format. These are the only books on Linux you will ever need! Whether you are a beginner or advanced user, you will find exactly what you need in these clear, easy-to-read guides. Study the material as you wish: Print just a few pages at a time, follow along on your computer screen as you type commands and learn, or open and read a guide on your PDA or iPhone when you are in the mood for learning! The set also includes a Quick Reference Card of Linux commands, so you'll always have what you need at your fingertips, when you need it! All PRIZIX products are U.S. made and 100% covered by warranty. The preinstalled USB stick allows to try and learn Linux without touching anything on your Windows! Our preinstalled USB stick allows trying and learning Linux without touching anything on your Windows! Do you know Linux? Are you new to it? Have you always wanted to try but were afraid, wondering if it was too geeky? Are you using it now but looking for a better installation? Are you looking for Linux books and clear instructions? Or maybe your Windows-based computer has caught another virus and you've had enough of that? Relax! PRIZIX has some simple, complete and inexpensive solutions for you. Our Linux sets offer you the very best in effortless installation, so you'll be up and running in no time! If this is your first time with Linux, you will appreciate the beautiful, clear graphics that make custom installation so easy. All our sets contain only the newest, most complete DVD releases. You'll find office suite, web, email, instant messengers, graphics, audio and communication tools, you name it! No hassles, no license fees, no prohibitively expensive software! All our sets include the "UNIX Academy Selected Training Library" in PDF format. These are the only books on Linux you will ever need! Whether you are a beginner or advanced user, you will find exactly what you need in these clear, easy-to-read guides. Includes complete DVD installations for full OS including lifetime free updates! DVDxDVD has some simple, complete and inexpensive solutions for you. Our Linux sets offer you the very best in effortless installation, so you'll be up and running in no time! If this is your first time with Linux, you will appreciate the beautiful, clear graphics that make custom installation so easy. Installations for both 32-bit and 64-bit systems are included. All DVDxDVD products are U.S. made and 100% covered by warranty. Install and run your favorite Linux directly from USB flash! There's no need for DVD drive! And if you require DVD installation, the media is included too! The set also includes a Quick Reference Card of Linux commands, so you'll always have what you need at your fingertips! Productivity suite, Web browser, Instant messaging, image editing etc. Free updates. Relax! PRIZIX has some simple, complete and inexpensive solutions for you. Our Linux sets offer you the very best in effortless installation, so you'll be up and running in no time! If this is your first time with Linux, you will appreciate the beautiful, clear graphics that make custom installation so easy. Installations for both 32-bit and 64-bit systems are included. 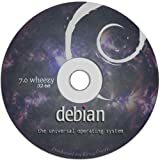 Debian Linux 7.0 "Wheezy" on DVD - Full Live / Install version. Debian, the grand-daddy (and great-grand-daddy) of dozens of Linux distributions, is perhaps the standard by which almost all other Linux distros are measured. Stable, fast, and slick, it is one of the best choices for anyone who wants to run Linux. This DVD is the live Gnome version of the newest and best release of Debian - 7.0 - codenamed "Wheezy" - packed with the latest and greatest technologies and features available to any Linux distribution. Unlike partial CD releases, this set contains real complete DVD release with ALL desktop and server applications included. During the guided graphical installation you can choose desktop, laptop or server configuration. All our Linux products contain only the newest most complete DVD releases. You'll find included office applications, web browsers, email programs, instant messengers, graphics packages, audio, video and communication tools, you name it! No hassles, no license fees, no prohibitively expensive software! PRIZIX is legendary for its top quality Linux products and same day Customer Care, registered and legally operated business since 2007. This DVD comes with Complimentary Linux Evaluation Exam from UNIX Academy.